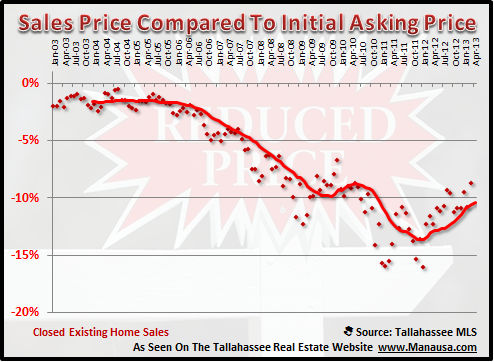 Several times each year, I like to analyze the current trend of home sales price compared to initial asking price. Some people look at this "spread" to determine the discount in the market, but I do not think that is what it reveals. I believe the discount between final sales price and initial asking price, when measured against the full field of sold homes in a market area, shows the level of motivation of home sellers in general. The biggest mistake among home sellers who fail to get top dollar for their home occurs when they choose a real estate agent to help them sell their home. They hire a "less than the best" agent, usually an old friend who is not one of the more active agents in the Tallahassee real estate market, and one who is not as qualified to give them the exact market guidance that will produce optimum results. The guidance that we give for setting the right initial asking price is often the reason that our home sellers get sold while more than 50% of all sellers in the market fail to sell during their first listing period. When we look at the one-year trend of sales price versus initial asking price, we see that it is improving. In the real estate graph above, we see the ratio of sales price to initial asking price has ranged from 2% down to as low as 13%, but currently is recovering and is at 10% right now. What most sellers do not realize is that they are effectively removed from the majority of property searches done by serious buyers when they over-price their homes, thus they are not truly "on the market" when they select a price at which all serious buyers will reject their home. Apparently, more sellers are getting the message. Also, with inventory running lower and values recovering in several price ranges, this ratio is being aided by higher values. This is the second most important thing that you do, following selecting the real estate company that you will have market your home. If you would like to discuss your options for selling your home, including the smartest initial asking price, just drop me a note and we can schedule a time to show you how to do it right.